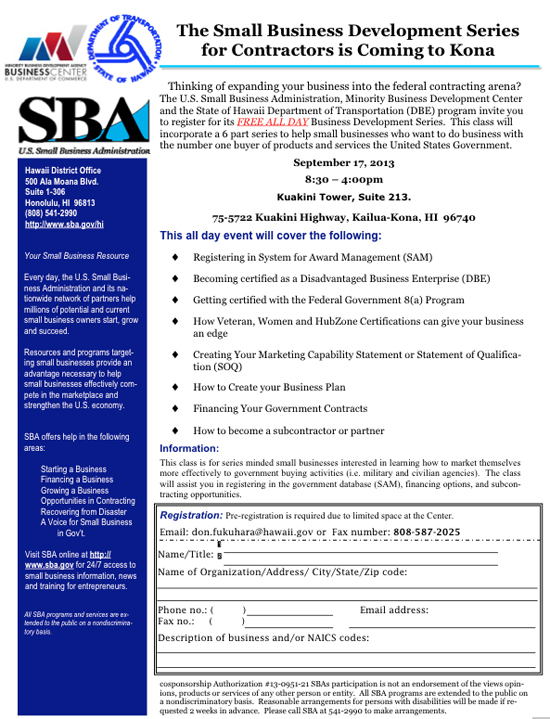 The U.S. Small Business Administration (SBA), MBDA Business Center Honolulu and state Department of Transportation will host a free all-day government contracting workshop for small businesses 8:30 a.m.-4 p.m. Sept. 17 at Kuakini Tower in Kona. The event will cover registering in the System for Award Management (SAM), applying for Disadvantaged Business Enterprise (DBE) Program certification, information on SBA business certification programs, marketing to the government, creating a business plan, financing government contracts and becoming a subcontractor or partner. Target audiences include veteran-owned or small businesses, such as contractors, subcontractors (construction related), consultants, haulers, suppliers, manufacturers and service providers. To register, download and complete the flyer at hidot.hawaii.gov/administratio… fax to 808-587-6333; or scan and email to don.fukuhara@hawaii.gov.